Good Morning ! I wanted to make sure that I post the routine I've been using to keep my hair healthy & happy. It's funny, because just as I get the hang of things, I have to switch up my routine because of the weather changing, or just because my hair becomes alittle longer. Just recently, I did my first rollerset on my natural hair !!! I was so happy and proud. It requires a different strategy with different results, but IT CAN be done !! I definitely will continue rollersetting my hair up until April so that I can see more of my true length. The first 2 pictures were of a flat iron to my nape only. The top picture was from November 09, the middle pic is from the very end of December 09, and the bottom picture is a wash and go from New Year's day. As promised, here is my most recent hair routine for the winter 2010. 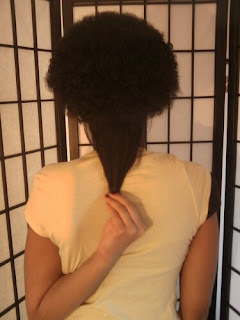 It may seem like I do alot, but in actuality it's very simple and extremely nourishing to my hair ! --> Lightly Oil my scalp at least every other day. 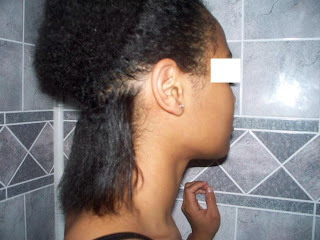 --> Apply Castor Oil to my edges everyday. -Prepoo w/ MillCreek Botanicals Organic Aloe Vera Conditioner mixed with some EVCO, Castor Oil & honey. -Cowash at least once a week [Organix Coconut Milk or Tresemme Vitamin E]. Twice a month shampoo, using KeraCare Hydrating Detangling Shampoo, or with Cream of Nature (green label). -Deep Condition under heat for 30-45 mins, using KeraCare Humecto Creme conditioner mixed with EVCO & AtOne Botanical Reconstructor, or with my Elasta QP DPR-11 mixed with EVCO & AtOne Botanical Reconstructor. -Prepoo with MillCreek Botanicals Aloe Vera conditioner or Silk Elements MegaCholesterol. Mix either of the 2 with EVCO, honey, and Aloe Vera Gel. -Cowash with Organix Coconut Milk, Tresemme Moisture Rich, Aussie Moist, or Herbal Essences Long Term Relationship . -Sometimes after cowashes, I'll deep Condition under heat for 30-45 mins, using KeraCare Humecto Creme conditioner mixed with EVCO & AtOne Botanical Reconstructor, or with my Elasta QP DPR-11 mixed with EVCO & AtOne Botanical Reconstructor. Usually I skip this second DC though. --> Take 2 multivitamins everyday. --> Take 2000 mcg of Biotin at least 3xs a week. --> Drink 8 full glasses of water each day, or more. 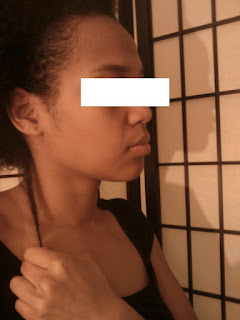 --> Detangle in the shower with my denman or shower comb with cheap conditioner on. --> Do ApHOGEE 2 min. Reconstructor Protein Treatments about twice a month. --> Clarify once a month w/ suave Clarifying Shampoo, then follow behind that with moisturizing shampoo. i just sat here for like 2 hrs watching your videos and not only were they amazing but i enjoyed watching them because you are such a nice person. I do have a few questions for you.....my hair has been natural since i was about seven, i am now 17 and my hair is about shoulder length, i dont know any other way to style my hair without using my straightener! I wash and straighten my hair every two weeks...is that bad, should i stop? Also, i liked how your hair looked with the honey method, does honey damage hair??? Hey Nakeisha, I only use EVCO as of lately, and I want to begin with my Wild Growth Oil again, even though the smell isn't the greatest hehehehe !!! Your edges will LOVE you for the castor oil !! My Second Rollerset on Natural Hair ! !